One night I walked from my apartment up to Portland’s tiny Japan Town and witnessed two old men sitting in a vast room playing go, a young man watching from the doorway. I went home and wrote this piece. It is typical of the sort of things I was writing at the time, fragments of larger stories never written. The Boy ran until it seemed his heart would shake itself free from his ribcage, cheap sneakers slapping the wet sidewalk, echoing off the alley walls, eyes wide and panicked, an animal’s eyes. The odors were in themselves a torture: garlic and oil in a hot wok, rich stocks on back burners throwing bellows of thick steam, wheaten buns warm from fresh baking. His shrunken stomach registered these when his mind did not. His mind was occupied with the immediate problem of escape and survival. 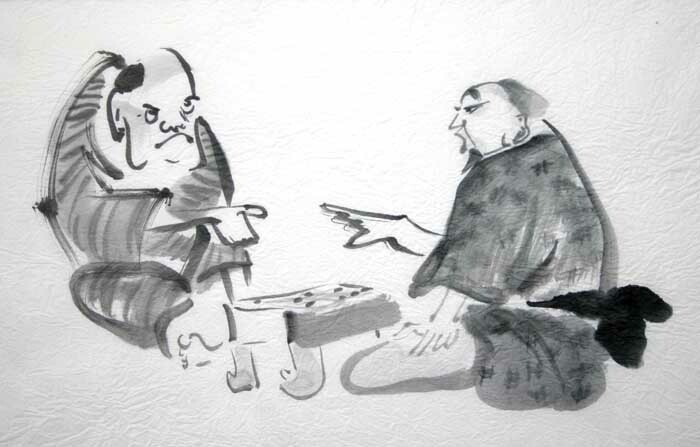 That morning he watched the old man playing Go with a Master who was visiting from Hokkaido, a suited, silent man who indicated his wishes with glances and intimation. Tea was served, and after some small ceremony the game board brought out. The Go Ke in their carved ivory box was retrieved from the padded chest. The old man and the Master knelt faced one another, dry fingers aloft, cradling the first stone as a violinist will hold his bow, the artless ease won from years of practice. When the stones were placed the board sounded like strokes on a drum, each note ringing clean in the still room. The Boy watched, daring no breath lest he alter the inexorable flow of the match. As the middle game opened and opportunities diminished, it became clear that the Master would lose, although his loss would be beautiful,with many brilliant moments. It was a game so profound and true it should have been recorded by a scribe for future generations to study, although of course it was not recorded. The Boy watched wide-eyed as the inevitable drew closer and finally descended. Tsuru no Sugomori . The old man was the winner, though the Boy felt he had shared the victory. It was as if a beautiful and full life had been painted before him on a living canvas; the totality and poetry of it lingered in the air as the scent of blossoms will hang about an arbor in spring. But that was this morning. Now, because of the money, the Boy was dead. There was no place he could run where he would not be found, no one who would risk the total annihilation which aiding him would bring. The Boy ran on, his strength ebbing. Posted in Ancient Personal History, Fragments, Überhaus Diary. Bookmark the permalink. Dreamlike and mythical and lovely to read. Aw, thanks. I almost never get comments on these.